LUCAS CRANACH 6 wins from 1800m to 2400m, €107,400, A$662,000, MRC Peter Young S., Gr.2, Hamburg IDEE Hansa Preis, Gr.2, Le Croise-Laroche Grand Prix du Nord, L, 2d Lyon-Parilly Prix Rene et Jacques Bedel, L, 3d VRC Melbourne Cup, Gr.1, 4th Longchamp Prix d'Hedouville, Gr.3. He entered stud in Aust. in 2013. Sire of 65 progeny to race, 24 winners (36.0%), earnings of over $1.0 million, inc.
Get Stuck In (14g, Fastnet Rock, Grand Lodge). 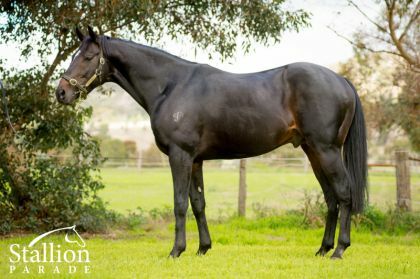 5 wins from 1200m to 1600m to 2018-19, A$136,150, BRC Www.brc.com.au H., Hamilton Hotel H., Keiba Asiatic H., Rockhampton JC Mini Loads Ken Russell Memorial H., 2d BRC TAB H.
Lucabelle (14g, Strategic, Zabeel). 3 wins from 1200m to 2000m to 2018-19, MVRC Adapt Australia H.
Advance Warning (15g, Commands, Canny Lad). Winner at 1700m in 2018-19, Ipswich TC Carlton Mid P.
The Cartoonist (14g, Happy Giggle, Arena). 3 wins from 1400m to 1600m to 2018-19, A$81,815, 2d ATC ANZ Bloodstock News H.
Stealthy Lucas (14g, Ladoni, Top of the Pack). 3 wins from 1600m to 1700m in 2018-19, A$81,860, 3d VRC Melbourne Cup Carnival Country Final H.
Hemmerle (14g, Nuclear Freeze, Zeditave). 2 wins at 1300m in 2017-18, 2d ATC TAB Highway H.-twice, 3d ATC TAB Highway H.
Lucadeal (15g, Redoute's Choice, Marauding). Winner at 1800m in 2018-19, 3d BRC TAB H.
Arty Lucas (14g, Shamardal, Peintre Celebre). Winner at 1450m in 2017-18, 2d MRC Ladbrokes Multiverse H., SAJC LUCRF H.
Scramjet (15g, Jet Spur, Anabaa). 2 wins at 1200m, 1600m in 2018-19. Jukila (14g, Woodman, Targowice). 2 wins at 1600m, 1800m to 2018-19. Magnum Opus (15g, Artie Schiller, Belong to Me). Winner at 1700m in 2018-19. Flash Aah (15g, Hotel Grand, Quest for Fame). Winner at 1200m in 2018-19. Printmaker (15g, Umatilla, Desert King). Winner at 1800m in 2018-19. Genzebe (15f, Viscount, Luskin Star). Winner at 1600m in 2018-19. Frank the Yank (15g, Happy Giggle, Danzero). Winner at 1600m in 2018-19. Renascence (15g, Desert Sun, Western Symphony). Winner at 1000m in 2018-19. Go Luca (14f, More Than Ready, Danehill). Winner at 1000m in 2018-19. Lucas Queen (14f, Umatilla, Desert King). Winner at 2150m in 2018-19. Darkside (14g, Nadeem, Star Way). Winner at 2000m in 2018-19. Danluca (14g, Danger, Raffindale). Winner at 2450m in 2018-19. Crash Cranach (14g, Danehill Dancer, Fairy King). Winner at 1400m in 2017-18. Oscar Cranach (14g, Galileo, Racing is Fun). Winner at 1400m in 2017-18. Front of Stage (14g, Trotamondo, Marscay). Winner at 1400m in 2017-18. All About Alice (14f, Archway, Rare Pearl). Winner at 1450m in 2018-19. King Cranach (15c, Brave Hawk, Semipalatinsk). Placed at 3 in 2018-19. Game Has Changed (15g, Citidancer, Tap on Wood). Placed at 3 in 2018-19. Calliandra Girl (14f, Voltage Peak, Sham). Placed in 2018-19. Mad Pirate (14g, Secret Savings, Casual Lies). Placed at 2 & 3 to 2017-18. Manestream (14g, Dehere, Kashani). Placed to 2018-19. Mylex (14f, El Qahira, Bletchingly). Placed to 2018-19. MAMOOL (IRE) (Bay 1999-Stud 2006). 8 wins-1 at 2-from 1600m to 3250m, Cologne Preis von Europa, Gr.1. Sire of 181 rnrs, 104 wnrs, inc. SW Lucas Cranach (Hamburg IDEE Hansa Preis, Gr.2), Orsino, Lips Poison, Plein Ciel, Early Morning, Lamool, Orluna, Semina, SP Fair Boss, Erica, Ormito, Just Win, Lips Planet, Poolparty, Appleby and of Atack, Maximool, Revanta, Diamool, Idroscalo, Accino, Walenty, Lord Emery, Piccolo, Miss Mae, Lucky Lips, etc. LUCAS CRANACH (c by Mamool (Ire)) 6 wins. See below. Lady of Budysin (f by Soldier Hollow) Winner at 2 in Germany, Frankfurt Quotenhaus Frankfurt BBAG Auktionsrennen, 2d Baden-Baden Preis des Casino Baden-Baden, L, Dresden Sachsen Preis, L, 4th German One Thousand Guineas, Gr.2, Hannover Grosser Preis von German Tote, Gr.3, Hamburg Hanshin Cup, L.
Lady Kate. 4 wins at 1400m, 1600m in Hungary. Lord of Budysin (c by Royal Dragon) 7 wins from 1750m to 2600m in Italy. Lady Cranach (f by Adlerflug) Placed at 3 in Germany. Lots of Tea. 2 wins at 2200m, 2400m to 2019 in France. Leo Fantastico. Winner at 2800m in Germany. LOTS OF LOVE (f Java Gold) 4 wins. See above. Lost Line (g Linamix) Winner at 1850m in Germany, 3d Grosser Preis der Stadtsparkasse Dortmund, L.
Replicant. 5 wins from 2000m to 2400m in Norway, 2d Longchamp Prix du Luxembourg, 3d Longchamp Prix du Pre Saint-Gervais. Winning Breeze (f Mamool) 2 wins at 2300m, 2400m in France. Love Run. Winner at 1600m in Sweden. Send You a Wind. Winner at 1800m in Czech. Always George. Placed at 3 in Spain. Latin Love. Placed at 3 in Germany. Ziger. 4 wins-2 at 2-from 1000m to 2400m in Russia. Sidney. Winner at 1800m in Russia. Lost Love (f Acatenango) Winner. See above. Laible (g Lightning) 12 wins in Germany, 3d Hamburg Cognac Hennessy Rennen, L.
Lena. Winner at 1800m in Austria, 2d Milan Premio Lanzo. Louis d'Or. 5 wins in Germany and Czech. Lataxo. 4 wins in Germany. Lara Regina. 2 wins in Germany. Producer. Lukas. 2 wins in Germany. INIMAGINABLE - WHEEM (Sda) (c Contested Bid) 5 wins-1 at 2-at 1400m, 1800m in Argentina and Saudi Arabia, San Isidro Clasico Ensayo, Gr.2, 2d San Isidro Clasico Provincia de Buenos Aires, Gr.2. Race Record: 12 Starts 6-1-1 €107,400, A$662,000. MAMOOL Champion Older Male in Germany in 2003 (Long). 8 wins-1 at 2-from 1600m to 3250m, £233,005, €641,450, 25,498,611L., 210,000Dhs, Baden-Baden Grosser Preis von Baden, Gr.1, Cologne Preis von Europa, Gr.1, Yorkshire Cup, Gr.2, Royal Ascot Queen's Vase, Gr.3, Kempton September S., Gr.3, Goodwood Glorious S., L, Nad al Sheba Khas el Dhaheb S., Goodwood Uniq Foodservice Gold Cup 2YO S., 2d Newmarket September S., Gr.3, Newbury Washington Singer S., L, Newmarket Pina Colada 2YO S., 3d Newbury Geoffrey Freer S., Gr.2, Deauville Prix Gontaut-Biron, Gr.3, 4th The St Leger, Gr.1, Milan Gran Criterium, Gr.1, Newbury Geoffrey Freer S., Gr.2, Lingfield Derby Trial S., Gr.3. He entered stud in Germany in 2006. 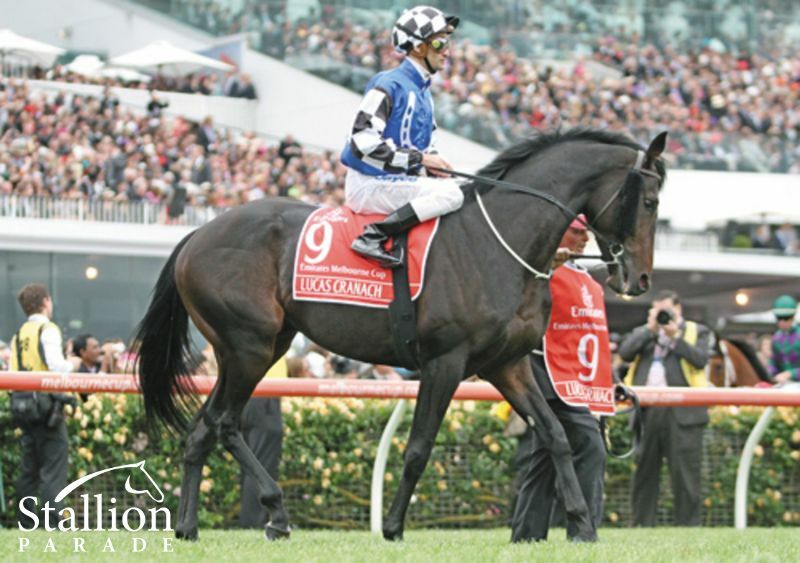 Sire of 181 progeny to race, 104 winners (57.0%), earnings of over $5.9 million, 8 stakes winners, 7 stakes placegetters, inc.
LUCAS CRANACH (07c, Java Gold, Acatenango). 6 wins from 1800m to 2400m, €107,400, A$662,000, MRC Peter Young S., Gr.2, Hamburg IDEE Hansa Preis, Gr.2, Le Croise-Laroche Grand Prix du Nord, L, 2d Lyon-Parilly Prix Rene et Jacques Bedel, L, 3d VRC Melbourne Cup, Gr.1, 4th Longchamp Prix d'Hedouville, Gr.3. ORSINO (07c, Platini, Lichine). 11 wins from 2200m to 2800m, €260,373, Milan Premio Federico Tesio, Gr.2, Rome Premio Carlo d'Alessio, Gr.3, Milan Premio di Lombardia, Premio Cavalchina, Premio Mario Locatelli, Premio Riccardo Zanocchio-3 times, 2d Gran Premio di Milano, Gr.1, Milan Premio Federico Tesio, Gr.2, Deauville Prix Equidia, Milan Premio Teatro Della Scala, 3d Milan Gran Premio del Jockey Club, Gr.1, Premio Duca d'Aosta, L, Coppa d'Oro di Milano, L, 4th Milan Premio Federico Tesio, Gr.2. LIPS POISON (08f, Ashkalani, Royal Academy). 2 wins at 1600m, €110,500, German One Thousand Guineas, Gr.2, Munich Grosser Preis der Brauerei Aying BBAG Auktionsrennen, 2d Baden-Baden Scherping Rennen, L, 4th Baden-Baden Preis der Winterkonigin, Gr.3. PLEIN CIEL (13g, Big Shuffle, Lando). 7 wins from 1300m to 2000m to 2018-19, €3,400, A$367,150, MRC Easter Cup, Gr.3, Legacy 2018 Badge Appeal H., Ladbrokes H., Swettenham Stud Championship H., Allan Wicks H., Ladbrokes Challenge H., 3d VRC Paris Lane S., L, MRC Manhari Metals H., Mildura Cup. EARLY MORNING (09f, Danzig Connection, Windwurf). 7 wins from 1800m to 2400m, €97,350, 1,200sFr, Hannover Grosser Preis des Gestüt Fährhof, Gr.3, Baden-Baden Preis des Gestut Etzean, 2d Hamburg Esso Cup, L, 3d Baden-Baden Preis der Baden-Badener Hotellerie & Gastronomie, L, Cologne Grand Prix Aufgalopp, L, Hannover Grosser Preis Jungheinrich Gabelstapler, L, Baden-Baden Preis der Gemeinde Muggensturm, 4th Cologne Gerling Preis, Gr.2, Hannover Grosser Preis der VGH Versicherungen, L.
LAMOOL (07g, Windwurf, Lagunas). 10 wins-1 at 2-from 1600m to 4350m, £45,987, €129,460, Mülheim Silbernes Band der Ruhr, L, Munich Grosser Preis des Lotto in Bayern, 2d Baden-Baden Badener Steher Cup, L, Auteuil Prix Achille-Fould Hurdle. ORLUNA (07f, Acatenango, Lagunas). 6 wins from 2200m to 3000m, €93,339, Hannover Grosser Preis von Pastorius, L, Deauville Prix de Coudray-Rabut, 2d Milan Premio Duca d'Aosta, L, Premio Emilio Trenta. SEMINA (07f, Second Set, Alwuhush). 2 wins at 1400m, 2000m, Baden-Baden Badener Ladies Sprint Cup, L, 2d Baden-Baden Cup, L, 3d Hamburg Rudolf August Oetker Gedachtnisrennen, 4th Bremen Grosser Preis des Courtyard by Marriott Bremen, L.
Fair Boss (08c, Dashing Blade, Big Shuffle). Champion 3YO Stayer in Germany in 2011.5 wins from 2100m to 2800m, €88,090, 24,000sFr, Avenches Grand Prix des 3 Ans, Longchamp Prix du Val de Grace, 2d Dortmund Deutsches St Leger, Gr.3, Preis des Casino Baden-Baden, L, Baden-Baden Preis des Gestut Wittekindshof, Hamburg Rudolf August Oetker Gedachtnisrennen, Munich Konrad Werner Wille Memorial, 3d Longchamp Prix de Fausses Reposes. Ormito (13g, Acatenango, Lagunas). Winner at 2, £41,182, A$167,800, 2d SAJC Adelaide Cup, Gr.2, Newbury Geoffrey Freer S., Gr.3, Hamilton Glasgow S., L, MVRC Bertocchi Christmas Masterpiece H., 3d Chester Vase, Gr.3, VRC Bagot H., L, Roy Higgins H., L, Goodwood Cocked Hat S., L, Moonee Valley Night Cup, L, 4th ATC Chairman's H., Gr.2, Newmarket Zetland S., L.
Erica (13f, Bollin Eric, Selkirk). Winner at 2200m, 2d Cologne Frühjahrspreis des Carl Jaspers Versicherungskontors, L, 3d Baden-Baden T von Zastrow Stutenpreis, Gr.2, Preis der Baden-Badener Hotellerie & Gastronomie, L, Hannover BBAG Auktionsrennen. Appleby (08c, Law Society, Marduk). 4 wins at 2200m, 2400m, Deauville Prix de Grandcamp, 2d Bremen SWB Derby Trial, L, Mons-Ghlin Open de Mons, 3d Maisons-Laffitte Prix Sourdine, 4th Dresden Preis der Ostdeutschen Sparkasse, L.
Just Win (13f, Dansili, Capote). Winner at 1600m, €78,010, Chantilly Prix Madrine, 2d Clairefontaine Prix Radio Balances, Compiegne Prix de l'Association Nationale des Courses a Poney, 3d Chantilly Prix Volterra, L, Prix Lypharita. Lips Planet (13f, Ashkalani, Royal Academy). Winner at 1400m, 3d Düsseldorf Grosser Sparkassenpreis, L.
Poolparty (12f, Second Set, Baillamont). Winner at 2100m, 2d Milan Premio Mario Incisa, L, Premio Razza Spineta. Atack (09c, Tirol, Simply Great). Horse of the Year & Champion 3YO Colt in Slovakia in 2012. Champion Imported Stayer in Slovakia in 2013.5 wins from 2000m to 3200m, Bratislava Starohájske Kritérium, Slovenske Saint Leger, Zlatý Pohár, Velka Chuchle Ceske St Leger S., 2d Budapest Kincsem Díj, Bratislava Slovenské Derby, Velká cena BBAG Baden-Baden. Maximool (09c, Alkalde, Aveiro). 3 wins at 2200m, 2400m, Bratislava Slovenské Derby. Revanta (08c, Acatenango, Alpenkonig). 3 wins from 2000m to 2400m, Dutch Derby, Derby Belge. Diamool (07g, Bin Ajwaad, Dancing Brave). Winner at 2400m, Klampenborg Dansk Derby, 2d Klampenborg Derby Testen, Derby Trial S.
Lord Emery (08c, Sillery, Wolver Hollow). 9 wins at 2400m, 2600m, €124,500, Longchamp Prix du Colisee, Saint-Cloud Prix des Coteaux de Saint-Cloud, Prix de Chambly, Maisons-Laffitte Prix du Conseil General des Yvelines-twice, 3d Chantilly Prix de Viarmes, Deauville Prix d'Anguerny. Piccolo (07c, Second Set, Baillamont). 5 wins from 1600m to 3200m, €86,400, Longchamp Prix de Fausses Reposes, Chantilly Prix des Aiguilles, Longchamp Prix du Colisee, Deauville Prix d'Amfreville, 2d Saint-Cloud Prix de Bezons, Deauville Prix de Formentin, Prix des Louveaux, 3d Saint-Cloud Prix de Marsinval, Prix de Bazemont, Prix d'Orthez, Chantilly Prix Longines Future Racing Stars, Deauville Prix des Vaches Noires, Maisons-Laffitte Prix de Mareil-Marly, Deauville Midi Prix De Gouffern. Idroscalo (14c, Fasliyev, Habitat). 4 wins from 1600m to 2400m to 2018, Milan Premio delle Patronesse, Premio Bernareggio, Premio Redorta, 2d Milan Premio Oreno, Premio Velate, Premio Vermezzo, Premio Stefania e Giorgio Sommariva, 3d Milan Premio Grezzago, Premio Tonale. Accino (12c, Tirol, Simply Great). 3 wins at 2200m, 2400m, Milan Premio Coppa della Sire, 2d Milan Premio Mario Locatelli, 3d Milan Premio Ornago. Walenty (12g, Sagamix, Königsstuhl). 3 wins at 2300m, 2500m to 2019, Deauville Prix du Clos Fleuri, 3d Deauville Prix de l'Ete. Eastsite One (12g, Bollin Eric, Selkirk). 7 wins-1 at 2-from 1300m to 2800m to 2018, 3d Munich BBAG Auktionsrennen. Loulou's Jackpot (12c, Green Tune, Acatenango). 6 wins from 1600m to 2200m, 3d Dresden Grosser Preis der Freiberger Brauerei. Moonlight Mole (13c, Pentire, Law Society). 5 wins from 1800m to 2400m, 3d Milan Premio Resegone. Shy Moon (11g, Monsagem, Broken Hearted). 4 wins from 2000m to 3100m to 2018, 2d Chantilly Prix de la Route d'Aumont. Lucky Lips (14c, Big Shuffle, Ashkalani). 3 wins at 1600m, 1700m to 2018, 2d Hannover Grosser Herbstpreis der Privatbank Oddo BHF. Nice Nelly (08f, Big Shuffle, High Line). 3 wins at 1300m, 1600m, 2d Baden-Baden Preis der Messe Karlsruhe, 3d Hoppegarten BMW Berlin Preis BBAG Auktionsrennen. His sire sons include Lucas Cranach, etc. One of the world's best racehorses, winning 6 races (and 2 placings) from just 12 lifetime starts in the best company earning almost $1 million. A Gr.1 winning grandson of world's top sire Sadler's Wells. Combines top class performance with a wonderful international pedigree ideally suited to all leading commercial bloodlines. Lucas Cranach won the Gr. 2 Peter Young S at his final start over 1800m defeating crack performers Illo, Manighar, Glass Harmonium, Southern Speed, Mourayan, Efficient, Zavite etc. At his previous start he finish a close 3rd in Gr.1. Melbourne Cup to champions Dunaden and Red Cadeaux, ahead of Americain, Manighar etc.